Home / Featured / How Long Should Your Wedding Veil Really be? How Long Should Your Wedding Veil Really be? Although weddings are seen as a traditional ceremony and many couples choose to commit to each other without one, there are still a large number of people every year choosing to tie the knot. From the more traditional celebrations through to modern marriage ceremonies, there is something to suit any couples who decide to get married. Whilst some couples are happy to have an intimate, family day, there is a growth in large extravagant weddings in the UK. Overall the average cost of a UK wedding has hit an all-time high, as this article from the Independent illustrates. The choices for planning your big day seem endless from style and location to the food and outfits. If you are looking for a wedding hotel venue in the Forest of Dean you could consider http://www.thespeechhouse.co.uk. 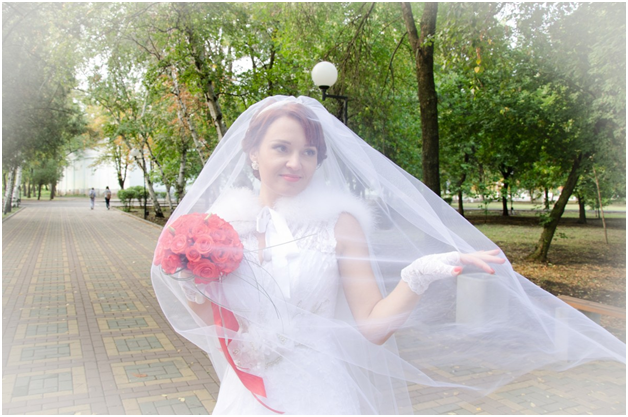 Whatever the size or style of your wedding, many brides still want that perfect dress and of course the perfect veil, so how do you pick the perfect veil to match your dress style and length? You may well be surprised at how much a relatively simple piece of lace or light fabric will cost, so before you consider style or length, you should set an approximate budget before you start to shop. Keep reading mother of the bride hairstyles. There are simple elegant veils or ones with embroidery or even added jewels or pearls. Consider which style will best match the dress you have chosen and the hairstyle you want to have on the day. Many lengths are available, from a short veil of around 4 to 9 inches which just covers the eyes or top half of the face, right through to a cathedral length veil of over 100 inches long which will trail on the floor alongside a bride’s train. The important thing is to pick a style and length that goes with the style of your dress – for more traditional ‘fairy princess’ styles, the longer lengths are probably the way to go, but for more modern, simple or elegant style dresses, a shorter look will likely be more appropriate. The main thing is to try the different styles on to see which suits your chosen hairstyle and your dress. Be prepared to try on many veils to ensure you get the perfect fit for your big day.